Cut intricate shapes with precision and control from foam or paper with the Slice 10580 Precision Knife. The zirconium oxide ceramic blade has a finger-friendly edge that is sharp for materials, but resistant to cutting skin, and the blade's straight-edge has a rounded tip for safety. 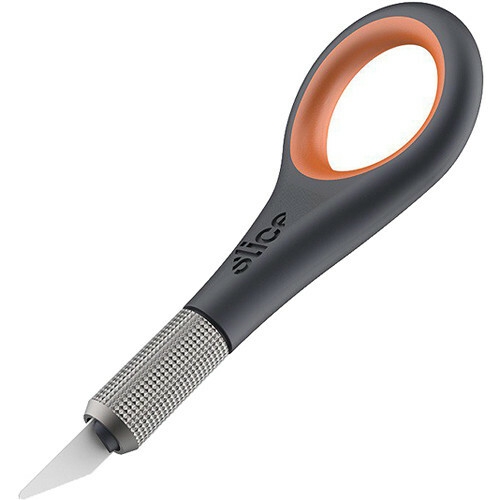 A comfortable, ergonomic opening in the handle allows easy holding of the knife and maximum control over the blade. The blade handle has a textured, non-slip grip and the blade is non-conductive, non-magnetic, non-sparking, and chemically inert, so it will never rust. The design is ambidextrous for both left- and right-handed users, and the handle is compatible with 10518, 10519, 10520, 10532, 10536, and 10537 blades, which can all be changed tool-free. Box Dimensions (LxWxH) 8.15 x 3.25 x 0.85"